Double Top Testing Tuesday - 8,900 or Bust! Well, here we go again. 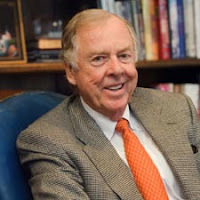 After his energy fund lost 98% and his equities fund lost 64% in 2008, Boone Pickens is back for more. Yep, he is raising money for new iterations of essentially the same hedge funds that his hedge fund BP Capital previously ran. Well, we don’t even really need to say "essentially" because they literally are the same funds just with a "II" at the end of the name, signaling their second incarnation. His Energy fund will trade futures and his Equities fund will trade energy related equities and some futures as well. His "II" Energy Fund started trading back in February and is already up a whopping 79%. It’s funny how they are undoubtedly using that as marketing material and you can’t blame them. However, investors should be aware that the exact same types of funds were obliterated last year. So, a 79% gain this year is not much when you consider how much they were down the year prior. According to fund documents, Pickens will aim to hold investments between 3 months and two years. If you’re curious as to what his firm owns, we’ve covered Pickens’ hedge fund portfolio recently here. So, we like to poke fun at both the fund managers themselves for their propensity to ‘blow up’ and come right back from the dead with a new fund offering. At the same time, we like to poke even more fun at the investors who continually come back for more. Such is life in hedge fund land. Speaking of ‘pokes, we know one institution who will be watching him carefully: The Cowboys of Oklahoma State University. Boone’s alma mater certainly loves all of his donations as he has helped revamp the athletics program there. But, after last year, you know they’ll be eagerly watching. This entry was posted on Tuesday, July 21st, 2009 at 10:48 am and is filed under Phil's Favorites. You can leave a response, or trackback from your own site.